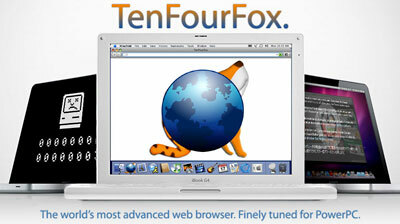 TenFourFox: The Best Browser for PowerPC Macs Running Tiger? Last November, I reviewed the then-current beta of TenFourFox, FloodGap's port of Firefox 4 for PowerPC Macs that supports both Mac OS X 10.4 Tiger and 10.5 Leopard. Firefox's developer, Mozilla.org, dropped support for OS X 10.4 after Firefox 3.6 and for PowerPC after the fourth beta of Firefox 4. Hopefully a year or two more anyway. Checking out a beta build of TenFourFox on the Pismo last fall, I found performance seemed to be pretty much on par with contemporaneous versions of the Camino and SeaMonkey Mozilla Gecko variants, which still support PowerPC Macs and OS X 10.4 (but probably not much longer according to a Camino blog report last week). However, TenFourFox was well shy of being ready for prime time browsing in late 2010, so I returned to SeaMonkey, Opera, OmniWeb, and recently Safari 4.1.3 for my OS X 10.4 browsing - all of which have their virtues and shortcomings. As I chronicled my browser adventures in Tiger, several readers have suggested that it's time for me to try TenFourFox again, so I have been doing so over the past week. I'm happy to report that the bugginess that plagued the beta I tried in November seems to have been pretty much ironed out, and TenFourFox is now at least as stable as any of the other remaining Tiger and PowerPC compatible browsers. Indeed, it's much more stable than either Opera 10.63 or Safari 4.1.3, both of which are crash-prone in 10.4. I haven't had a TenFourFox crash yet (at this writing), and the browser is a generally smooth performer. It starts up reasonably quickly - not as fast as Safari, but faster than Opera (mercifully it doesn't share Opera's text-entry stall bug in Tiger) - and it's respectably speedy too. On the other hand, TenFourFox seems to be a bit of a resource hog, but on the upside, its general performance doesn't deteriorate as uptime proceeds, as Safari and WebKit-based OmniWeb do to a lesser degree. It's early days yet, but if TenFourFox keeps working for me as well as it has so far, it may become my Gecko browser of choice on the Pismos. However, I have to say that in my estimation, the ultimate performance OS X 10.4 browser remains Netscape Navigator 9, support of which was discontinued two years ago. Navigator 9 is doubtless security compromised by now, and I wouldn't use it for, say, online banking or credit card purchases, but for general browsing it's faster than any of the current Gecko browser versions - and as stable as a rock. Back to TenFourFox, which requires at minimum a G3 Mac, OS X 10.4.11 or 10.5.8, 100 MB of free disk space, and 256 MB of RAM. For video playback, the developers strongly recommend a 1.25 GHz G4 or higher, and I concur. My 550 MHz G4 Pismos with their puny RAGE Mobility 128 GPUs and 8 MB of VRAM are not ideal hardware for video-watching (although you can do so in a pinch). Intel Macintoshes are not supported. G3 and G5 owners, just download the G3 and/or G5 build, respectively. These versions run on any G3 or G5 Power Macintosh. G4 owners will need to determine if their G4 is a 7450-series CPU ("G4e"), such as the 7447, 7447A, 7448, 7450, 7451, 7455 and 7457, or a 7400-series CPU, such as the 7400 and 7410. Typically the "G4e" series of CPU are in most G4s at and over 733MHz. Download the appropriate version of TenFourFox, and you're good to go. 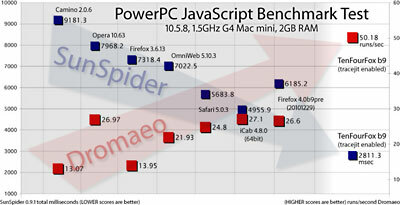 If you're still running a PowerPC Mac with Tiger (the Hitslink stats for March 2011 show it's holding its own with a 0.37% share of the total OS market*) or Leopard, TenFourFox is definitely worth a download. It may well be the best all-round browser choice for these machines if you want to get by with just one browser. It's not a perfect solution, but based on my relatively short term of use I would say it probably comes closer than anything else still available for Tiger-users, with the possible exception of OmniWeb 5. I'll give TenFourFox a three out of four rating.